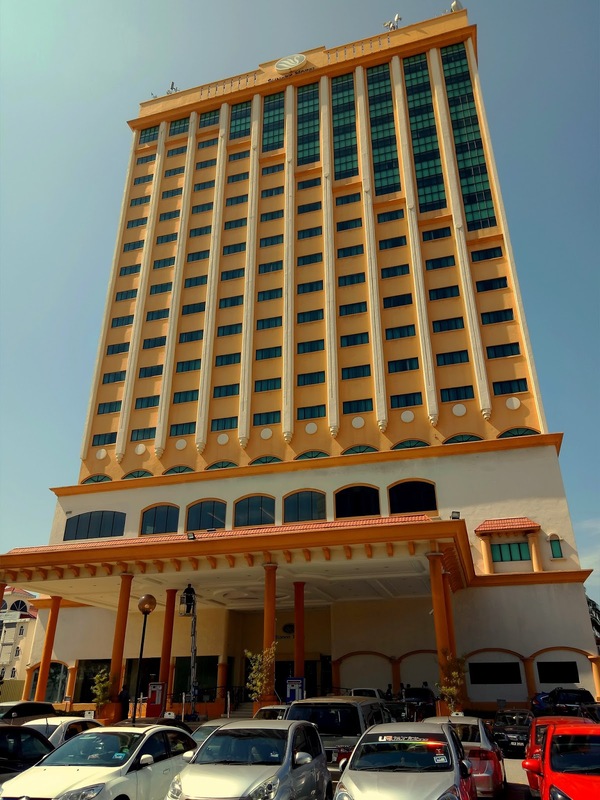 Sunway Hotel Seberang Jaya is a 3-star hotel near Sunway Carnival Mall. It satisfies the hospitality standards of a 4-star hotel but lacks a swimming pool. Sunway Hotel Seberang Jaya is the sister property of Sunway Hotel Georgetown. Sunway Hotel is the first hotel in Penang to showcase its Ramadan buffet this year. 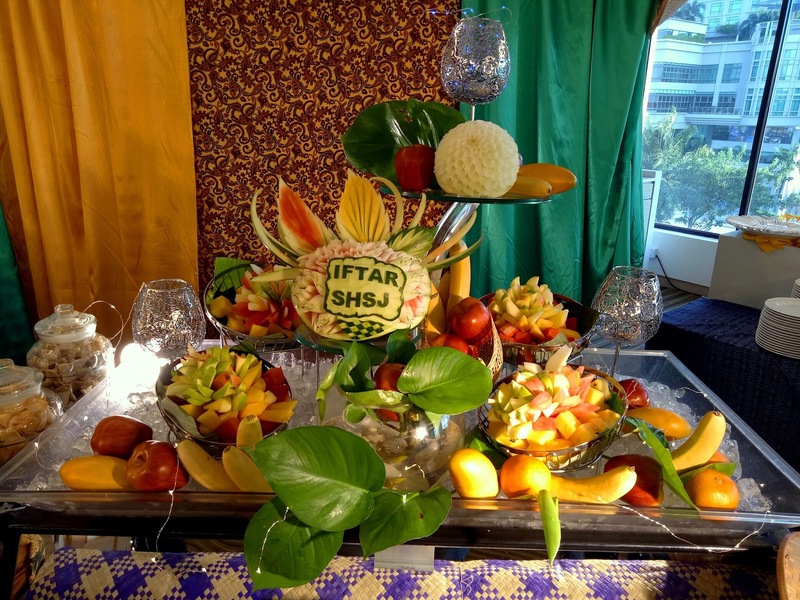 This year's theme is "Dari Dapur Sunway Selera Utara" (Northern Flavors from Sunway's Kitchen). 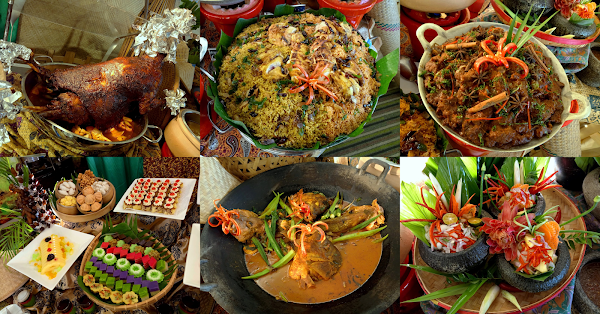 For today's preview, the kitchen crew has prepared a selection of Sunway Hotel's signature dishes. The actual buffet spread has more than twice the number of dishes this evening. The highlight of Sunway Hotel's Ramadan buffet is Kambing Golek. 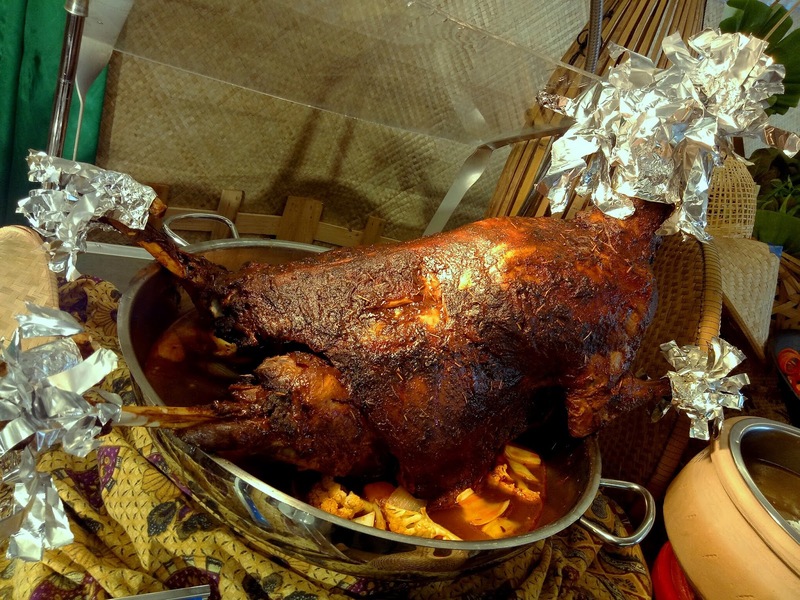 Cooked on a rotisserie, the roast mutton has the right doneness which makes the flesh gratifyingly juicy. Marinated with lovely spices, the mutton is delectable indeed. Black pepper sauce is provided as a condiment. Go easy with the sauce because its saltiness may overpower the mutton. Two rice dishes are prepared today. 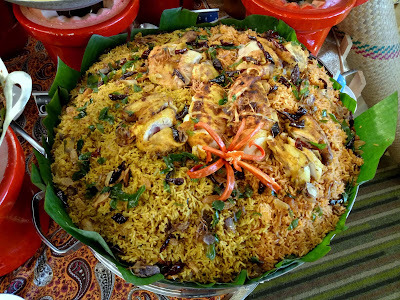 Nasi Tomato is tomato-flavored rice with a noticeable hint of sweetness. I enjoy the soft texture of long-grain basmati rice. The spice mix tantalizes my taste buds in a delightful manner. On the other hand, I feel that Nasi Briyani is too dry and does not have the fluffy mouthfeel that I desire. 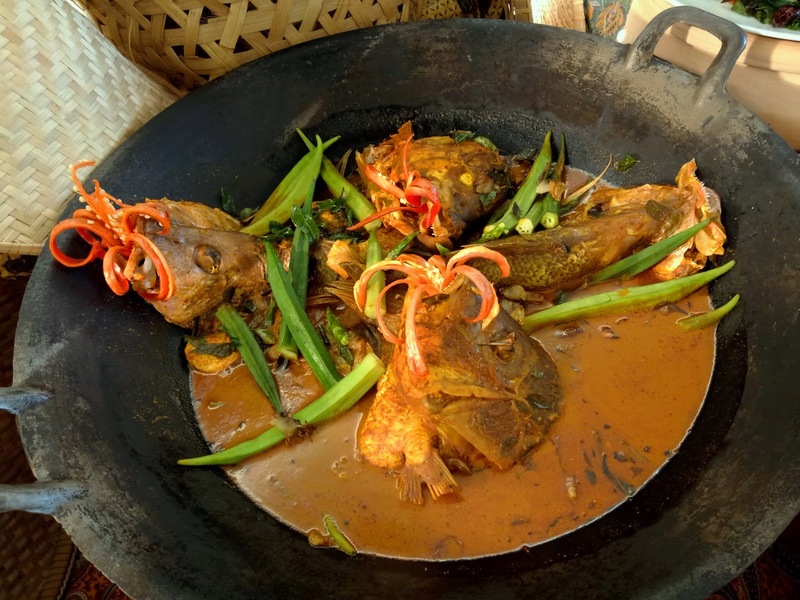 Kari Kepala Ikan is one of Sunway Hotel's signature dishes. 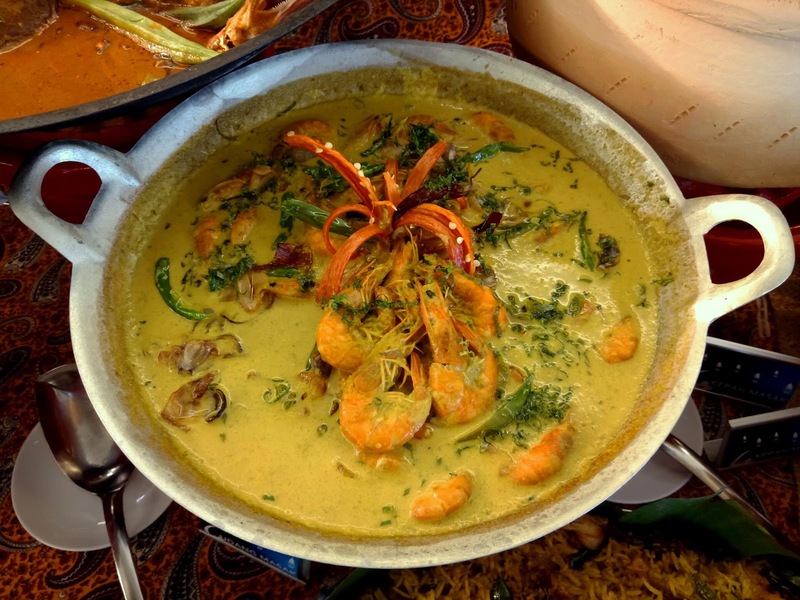 The curry has a creamy consistency that goes well with rice. The choice of fish is red snapper, which I think is an excellent choice as it readily absorbs the rich taste of curry. Okra (lady's fingers) is also included in the curry. Still on the topic of seafood, Udang Masak Cili Padi is served in yellow gravy that is infused with turmeric and coconut milk. Despite the presence of bird's eye chili, the gravy is not too spicy. However, I prefer the shrimps to be crunchier and larger in size. Rendang Daging was originally a Minangkabau delicacy but has entered the mainstream Malay cookbooks. The preparation process is time-consuming. 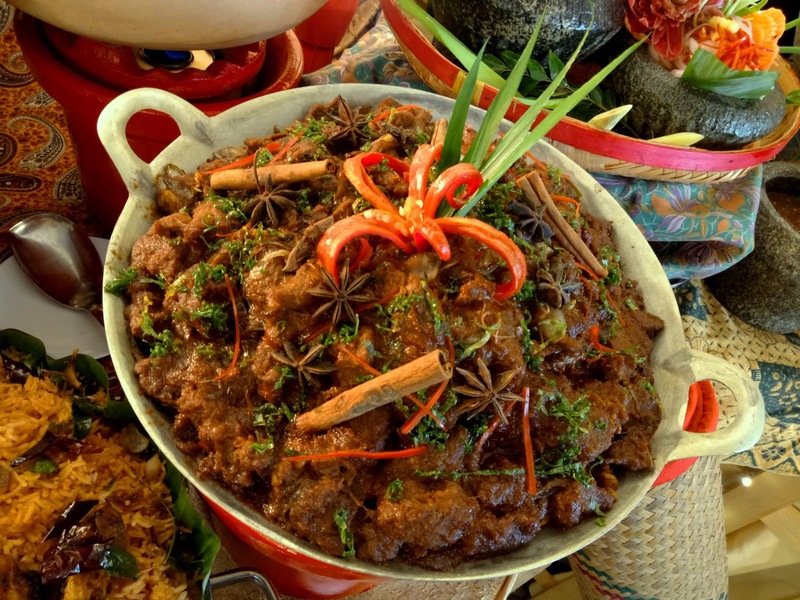 Beef is slow-cooked with coconut milk and spices for several hours until most liquid has boiled away. What remains behind are beef chunks saturated with succulent flavors. Although I am impressed by the beef's savoriness, I feel that the pungent spices tend to numb my palate. As for poultry, Ayam Madu is served this evening. The honey-glazed chicken is cooked with star anise, cinnamon, dried chili peppers and curry leaves. If you have an affinity for sweetness, this dish will be the right fit for you. 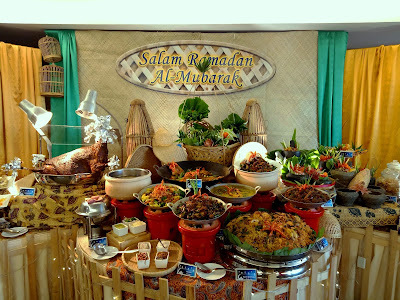 As per tradition, a Ramadan meal typically includes Malay salads. Some of these salads are acar rampai (cucumber & pineapple salad), kerabu sotong (squid salad) and kerabu pucuk kaduk (wild betel leaf salad). 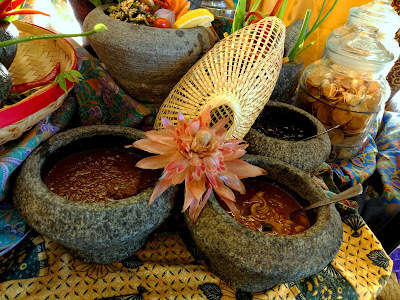 Diners can also savor an assortment of jeruk buah (fruit pickles) and keropok (crackers). 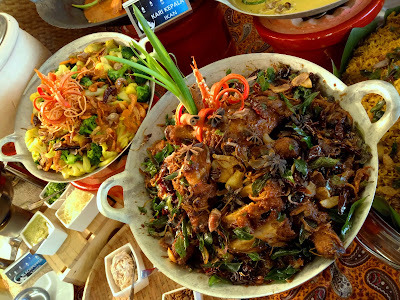 Ulam-Ulam Kampung is a collection of vegetables that are typically consumed raw. Examples of such vegetables are ulam raja (king's salad), daun pegaga (Asiatic pennywort leaves) and daun selom (selom leaves). 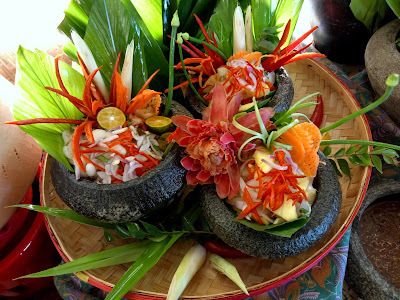 Raw vegetables are often eaten with powerful condiments such as sambal belacan (fermented shrimp sauce), air asam (tamarind sauce) and sambal kicap (spicy soy sauce). The sauces are presented in stone mortars. 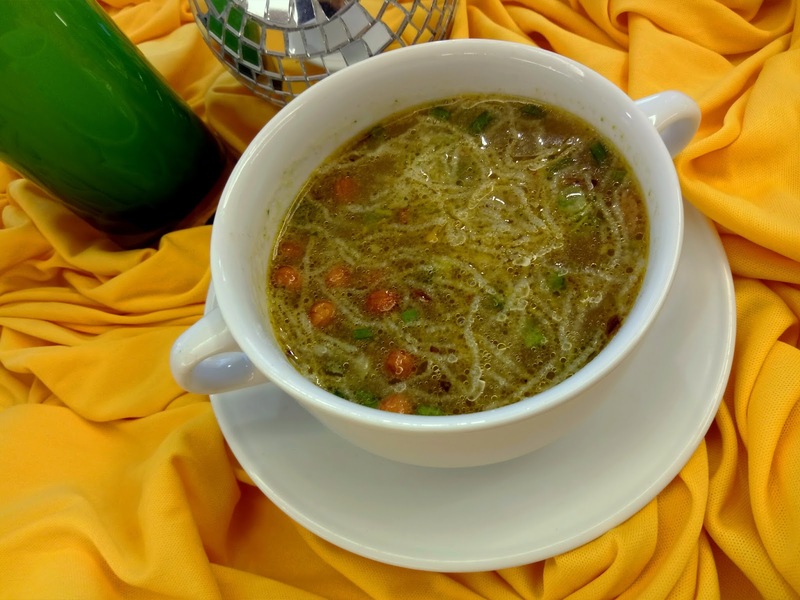 Hailing from Indonesia, Soto Ayam is a rich soup made from chicken broth and turmeric. 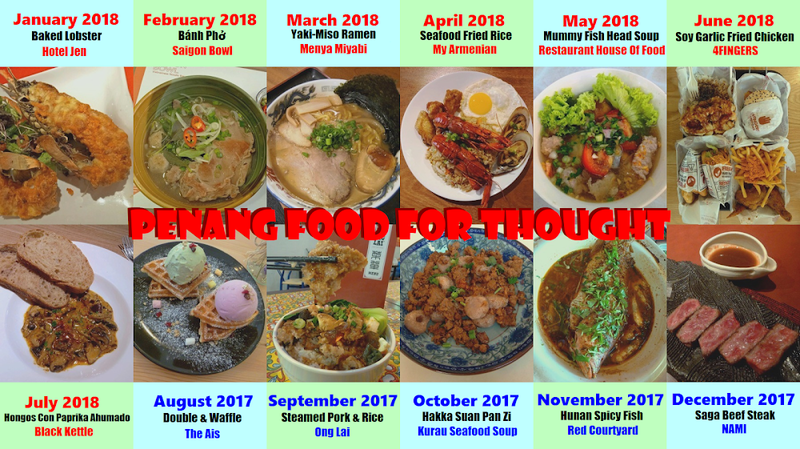 Diners may add ingredients like chili paste, shredded chicken, nasi impit (pressed rice), roasted peanuts, crispy rice noodle, fried shallots and chopped scallions. With a soothing chillness in my mouth, the soup really helps to building appetite. I am fascinated by the variety of traditional Malay kuih this evening. Presented today are puteri ayu, seri muka, kuih lapis, kuih talam suji, kuih lapis keledek ungu, kuih cara manis and kuih cara berlauk. 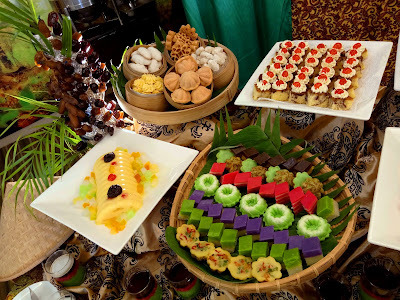 In addition, kuih semperit, kuih makmur, kuih loyang and kuih bahulu are also very popular during the festive month. Besides Malay kuih, the pastry kitchen has also prepared Western cakes such as marble butter cake and carrot cake. 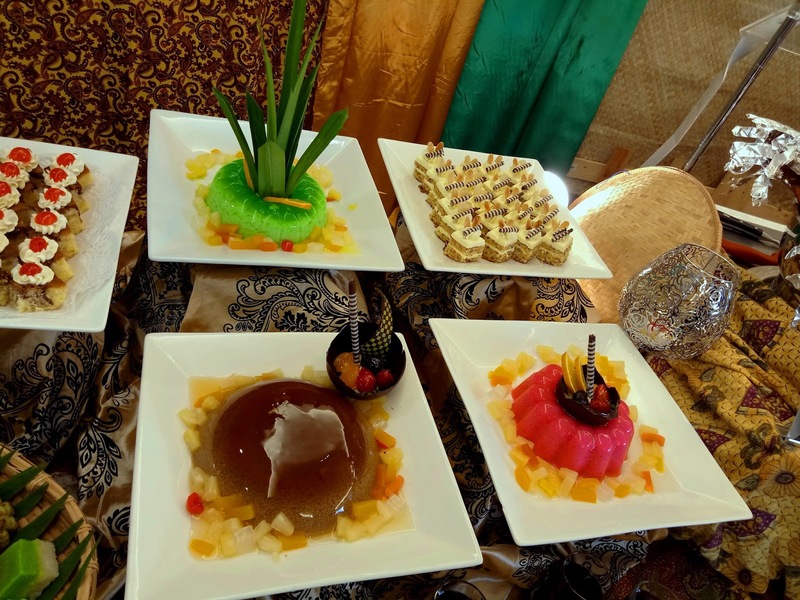 In addition, there are several types of puddings and jellies with different flavors like gula melaka (palm sugar), pandan and strawberries. 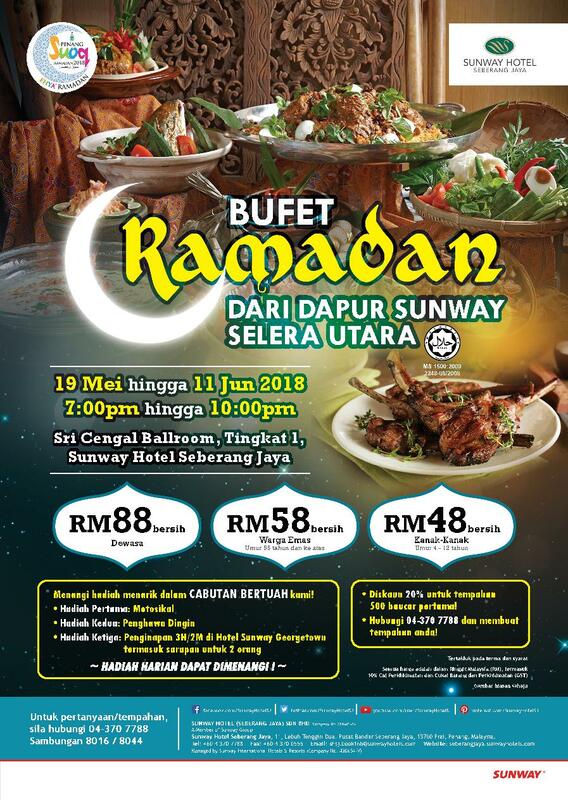 The Ramadan buffet at Sunway Hotel Seberang Jaya is held from 19 May 2018 to 11 June 2018. 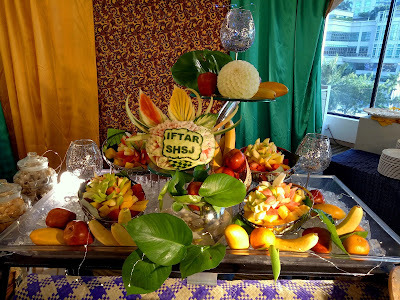 The buffet is priced at RM88.00 net per adult. 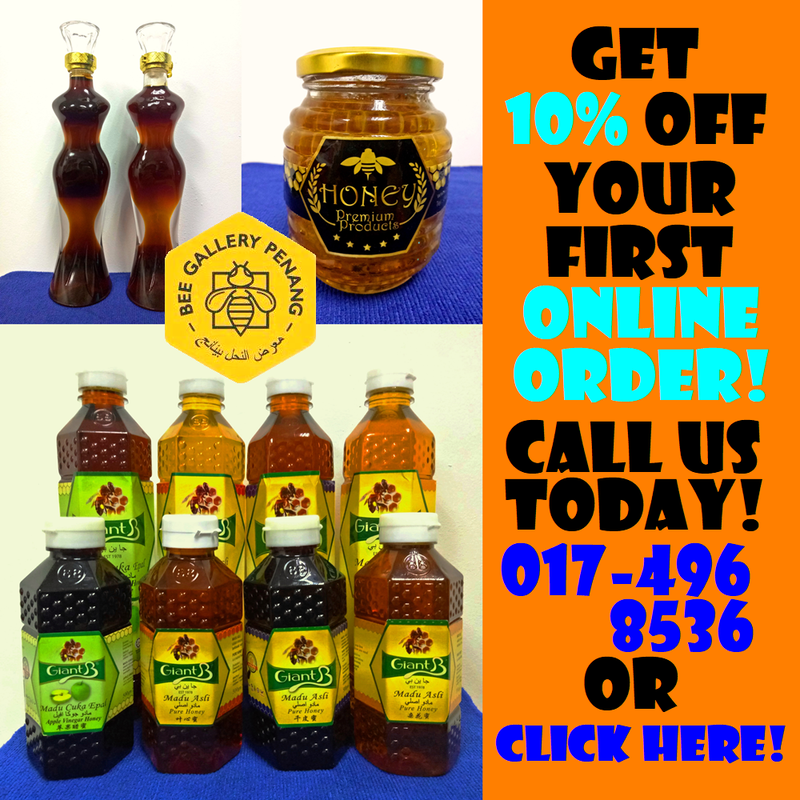 Children and senior citizens enjoy special prices of RM48.00 and RM58.00 respectively. During the campaign, the hotel is holding lucky draws where the grand prize winner goes home with a brand-new motorcycle! 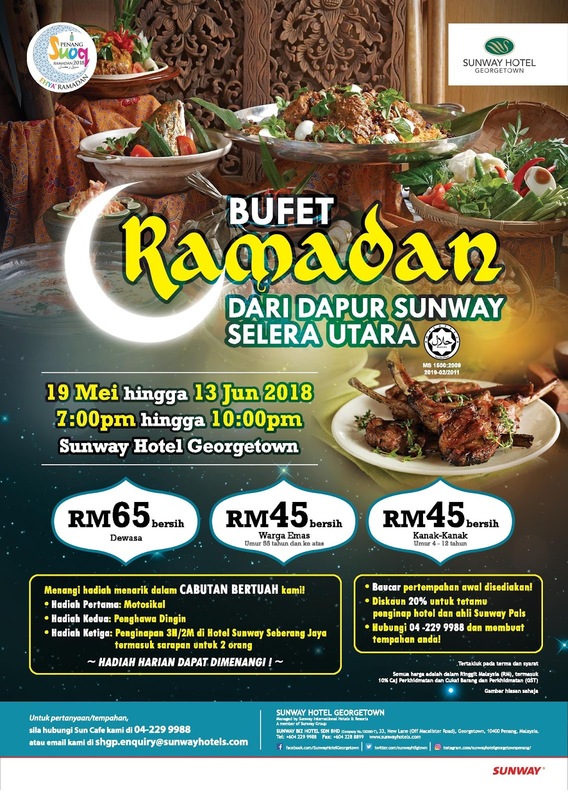 Meanwhile for residents of Penang Island, a similar Ramadan buffet is held at Sunway Hotel Georgetown. Directions: From Lebuhraya Utara-Selatan (North-South Expressway), take the Seberang Jaya exit and head west. Turn left just before the pedestrian bridge and drive all the way to the end. When the road splits, keep right. Sunway Hotel is further down on the right. There are parking spaces within the hotel's compound. The parking fee is RM4.00 per entry.